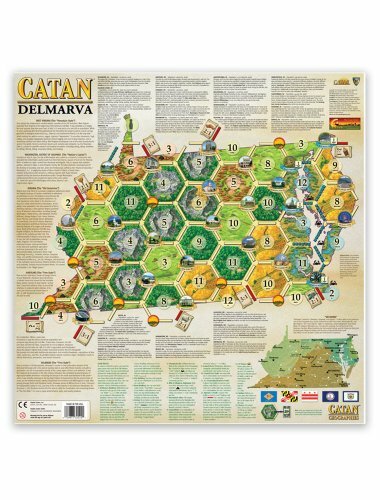 In order to settle the region of Delmarva, you need the game pieces and cards from The Settlers of Catan Base Game. You will also need additional markers for seafood and coal commodities and victory point (VP) tokens; you can use Catan chips from the Seafarers expansion, or alternatively coins. The standard Catan game rules apply to this scenario, with a few exceptions. Delmarva stands for “Delaware, Maryland, and Virginia.” It often refers to the peninsula east of the Chesapeake Bay. Greater Delmarva includes these states, Washington DC, and West Virginia. This “mid-Atlantic” region is marked by 4 distinct geographic zones (East- West): the wetland Tidewater area, including the penisula, the rolling lands of the Piedmont, the Blue Ridge (including the Shenandoah Valley), and the Allegheny Highlands (including the Allegheny Plateau and the parts of Appalachia to the north and west). It is one of earth’s oldest and most diverse ecosystems.